This is an interesting book. The more extensively you have read, the more you probably will like this. Even so, the plot is fanciful and interesting. Book lovers, English majors, sci-fi addicts and literature and art aficianados the world over will thoroughly enjoy the world that Fforde creates in this first of the Thursday Next series. Pick up this book! You will love it. Jasper Fforde's Thursday Next books are wonderfully engaging. The universe they are set in is wonderfully almost plausible. It wasn't written to be thoroughly realistic and convincing. I preferred it greatly over Hitchhiker's Guide because the humor in Eyre Affair is less slapstick and more intellectual. 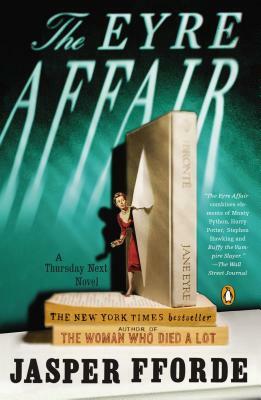 The Eyre Affair is the first book in Fforde's Thursday Next series, which actually get better as they go along, unlike many series. ?The Eyre Affair? can be described as fantasy-SF-comic-literary-mystery-thriller; it is quite a mouthful, and perhaps Jasper Fforde has bitten off a little more than most people with moderate talent could effectively chew. The blurb compares this book to ?The Hitchhiker's Guide to the Galaxy?, but unfortunately ?The Eyre Affair? lacks the whimsy of the former. Its narrative style emulates rather than parodies the hardboiled private eye genre, and both the prose and the plot are often dense and turgid. Even halfway through the book one doesn't quite grasp all the intricacies of the intriguing Universe of Thursday Next, and many of the much touted literary in-jokes are either too obvious or too obscure. Also, both the characters, as well as the situations, are too dark to be truly comic but also too flippant to be truly dark. There is no doubt that Jasper Fforde has a unique vision, but somehow, at least for me, he couldn't bring it all together. I guess I will just go back and read the Dirk Gently books again. This book is amazing. Jasper Fforde takes fantasy and makes it seem real.